How to Save Money on Prescription Medications! Generic drugs offer the same effectiveness at about one third of the price of brand-name drugs As the cost of medical care, including drugs, continues to grow, many members are looking for ways to save money on health care costs. 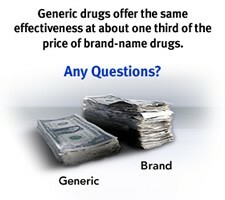 The price disparities between brand name and generic prescriptions can sometimes be unbelievable. For example, a common brand name drug prescribed to lower temperature and pain Crocin (10 pills, 500mg) sells at pharmacy for Rs.16 At the same quantity and dose, its generic Patmin can be obtained for just Rs 2. 4. Follow the steps sequentially as mentioned below. It can be done by clicking on the image of Manufacturer, Brand or Generic on the drug page. 4. On clicking on yellow button under the column of single generic, page appears showing the desired information. 5. On clicking on yellow button under the column of more than one generic, page appears showing various combinations of the desired generic. i) There are two search boxes at top of the table. ii) Enter the name of the desired generic in one of the search boxes as below. vi) In the case of single generic, page appears showing the desired information. vii) In the case of more than one generic, page appears showing various combinations of the desired generic. On the left hand side of drug page there is a box where following headings are shown. 1. ON CLICKING ON 1st COLUMN, page opens which shows the list of generics in alphabetical order. Enter the desired name in the search box, page showing the relevant generic appears. NOW CLICK ON SHOW, relevant page appears showing indications, contraindications, caution and side effects of the respective generic. One can also find the desired information by clicking on the “Show”. 2. Once one CLICKS ON 2nd, 3rd, 4th, and 5th COLUMN, respective pages appear which provide the desired information. 3. On clicking on last column, another page appears which shows drugs classified under fifteen sub groups. a. To know about the list of the drugs particular category click on “Click Here”. b. Page opens which shows the list of brands of specific group. c. There is a search box on the top of each table, you enter the name of the desired brand. f. Then click on the “Search”. g. Page appears showing the information about the desired brand. h. Follow the steps sequentially as mentioned above. Since generic drug companies do not have to develop a medication from scratch, it costs significantly less to bring the drug to the market. Once a generic medication is approved, several companies can produce and sell the drug. This competition helps lower prices. In addition, many generic drugs are well-established, frequently used medications that do not require expensive advertising. Be wise, buy generic drugs and save money.